The first snowstorm of October or November may be a cause for concern if you are planting shrubs or perennials, but do not worry about lily bulbs from B&D Lilies. Being completely dormant and safely tucked underground, they will not be harmed by the sudden changes in weather. Most areas of the Midwest and Northern Tier States will experience at least one rotation of "Snow - Thaw "- "Snow - Thaw" before winter sets in for good. Early snowfall is usually "soft" and will melt in a few days. If we notice the weather changing during shipping, we hold orders for a few days for the snow to melt. The warmer period following is an excellent time to do any last minute cleanup, but do not mulch your bulbs yet. Wait until the ground is completely frozen before spreading mulch, or rodents may take up residence under ground, feasting on the hidden storehouse of food you so thoughtfully left them. "You need not be reluctant to order lily bulbs for fall delivery. Prepare the site(s) around mid-October, digging holes and amending soil as necessary. Then either: (1) Mulch the bed with 6-8 inches of leaves, straw or whatever other material is available, or, (2) Remove soil to the depth at which the bulbs will be planted and store it in a garage (on an inside wall) or your basement. If you have removed the back filled soil, fill the hole and surrounding area with mulch material. Or, you could put the back fill soil in a plastic bag, set into the hole (with mulch over) and, after planting, empty bagged soil over bulbs. For a great number of lilies, it is more practical to store all the back fill, well-mulched, in a pile outside. Identify sites with a 3' garden stake tied with flagging tape (found in hardware stores). Use an indelible marker to register the name, number, and source of bulbs to be planted in the holes. When planting the lilies these "flags" will stand out, and you will not have to think (and possibly freeze) deciding where each bulb should go. When bulbs arrive, remove mulch and plant. Any snow will help your cause due to its insulating nature. Do not expose bulbs to freezing air any longer than necessary -- organize your bulbs before you go outside. Tamp soil to avoid air pockets and place your permanent stake (label). The actual planting is the quickest part, confirming the old adage that nine-tenths of the work is soil preparation. Don't mulch site(s) until soil has frozen over an inch or two. This procedure is totally successful here in Minnesota if followed carefully, and lilies can easily be planted in November." What about tulips, daffodils and bulbs from other suppliers that are arriving late this year? #1. 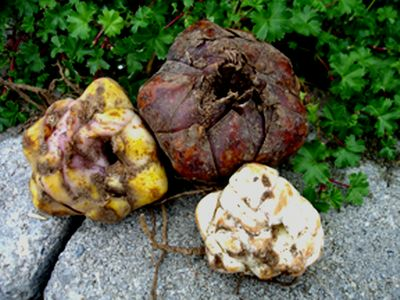 Check over the quality of the item, clean up and dip in a fungicide any damaged bulbs before planting. Tulips and Daffodils will probably be OK if the ground is not expected to freeze solid within the next few weeks. Growers in Holland are just now beginning their main lily bulb harvest, so any IMPORTED LILY bulbs in the USA right now, are either from last season's crop, or may have been harvested unnaturally early (August), before the bulbs had matured and hardened off. #2. Bulbs that were dug too early need perfect drainage or you risk losing them over winter. If you have already planted, but you have second thoughts about drainage and the ground is not frozen, we advise lifting the bulbs into a more raised area. This is especially important for bulbs that may have been heavily bruised if dug too early to arrive in the United States for planting in early October. #3. Mulch the soil after the ground has frozen for the season. Lily bulbs that were allowed to go into hard dormancy before harvest and are shipped in Mid to Late October, will tolerate less than perfect conditions, but to keep mice and other rodents from "nesting'" in the mulch and feasting on your bulbs, wait until the soil is frozen and the pests have found other accommodations for the winter. When B&D Lilies� has finished shipping lily bulbs for the fall, the crop that will be offered in the spring catalog is being dug now and through December. We send our spring offered bulbs to cold storage for the proper amount of chill, ensuring that the bulbs you receive from us have been treated in a manner that guarantees optimum performance the very first summer after planting.